Bunt is a brilliantly crafted corporate email newsletter, specially designed for different kinds of corporate sectors, blog, agencies, small & mid-sized business firms, creative studios and product promotion. Bestowed with stunning design and optimized code, Bunt has the potential to feed your marketing campaign and make it highly effective. In order to ensure the unparallel experience, this email template has passed through extensive testing phases. Additionally, there is an option to customize the theme to bring uniqueness in the layout that ensures prolific promotion. Approved from Litmus, Bunt renders qualitative experience to the end-users. This alluring corporate email newsletter template is Litmus tested that proves it as the best quality template that can render superb and pleasing experience to the users. Bunt supports the flexible & responsive layout built on HTML and other web technologies so that the users can access template through all the mobile devices. To ease customizing and ensure faster loading, it is highly ensured that the email template does not feature any garbage or useless code. And every file is properly organized. To ensure seamless accessibility for numerous readers, this advanced business email newsletter template has been designed to be compatible with MailChimp client. This corporate-centric email newsletter can be integrated with all the advanced monitoring systems so that end-users can evaluate & improve email marketing campaign. Bunt is fabulously crafted with highly functional elements that all make it suitable for different kinds of enterprise and small businesses. Our team of experienced and dedicated developers as well as designers relentlessly works to render superb email newsletter that can bring a remarkable difference. The extensive portfolio of email templates and 100% client content is an example of the well-proven strategy, consistency, and professionalism in our workflow. Following features of our company set us apart from the others. Major email clients, such as Gmail, Yahoo, Outlook, Apple mail, Thunderbird, Hotmail, AOL Mail, Android native client can deploy this email template seamlessly to render the best user experience. This brilliantly design newsletter template features layered PSD files, drag & drop functionality and HTML editor. That’s all empower the users to administer the template at ease. 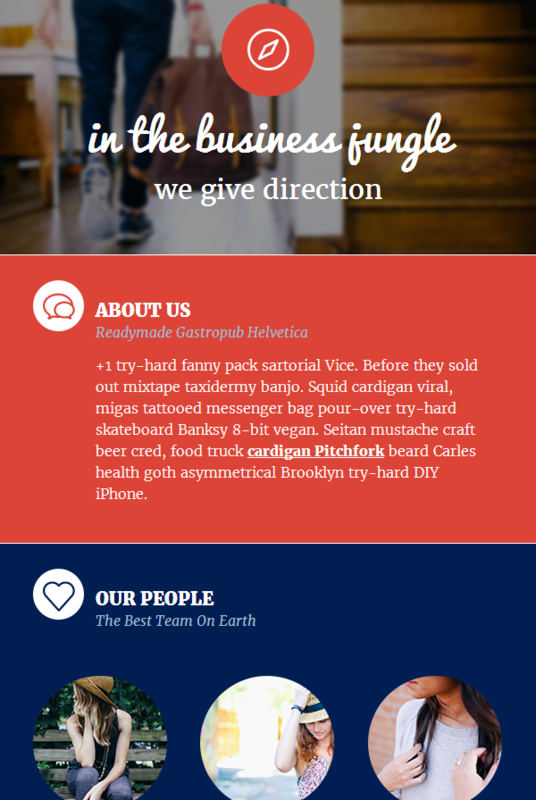 In order to ease the email newsletter template usage, it comes with brilliantly designed documentation. However, if the users face any problem, then technical support is 24/7 active. To ensure faster and seamless loading as well as easier customization, the email newsletter template comes with a neat & clean coding as well as inline CSS. Equipped with multifarious options, such as color scheme, themes, Google fonts and many others that allow the end-users to craft the email newsletter comfortably. 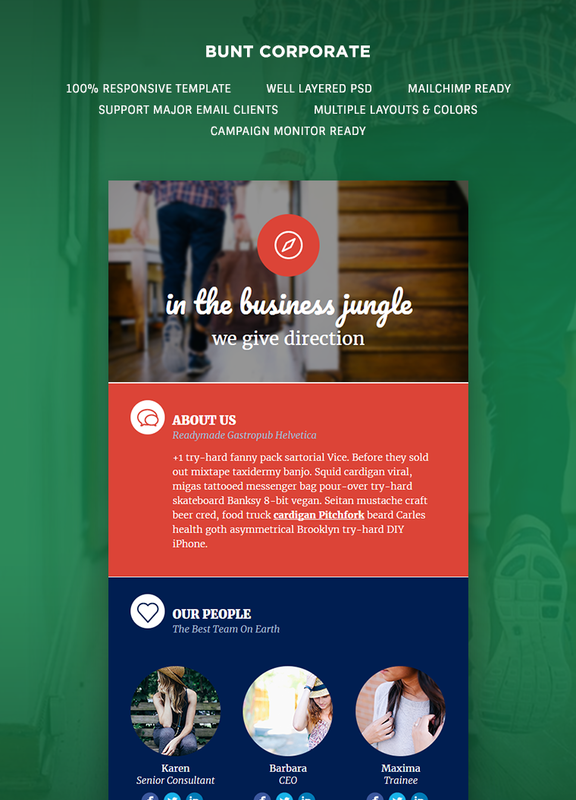 Installed with monitor ready support, this email template empowers the users to integrate the marketing functionality with this theme that will help the users to analyze the success rate.